As a pretty recent convert to the cult of California, there are almost endless options of new destinations for me to explore in the Golden State. Yet still, when planning out my two weeks there last fall, I was itching to return to Palm Springs. I’d loved my brief stay there the previous year, and vowed to return for longer as soon as possible. Locals warned the desert town would still be scorching in September, but I didn’t let a little thing like triple digit temperatures get in the way of a weekend with my dad, my boyfriend, my dear friend, and my dog. First, we had to get there. Kat, Ian, Tucker and I took the scenic route and spent about three hours with the top down, winding our way from San Diego to Palm Springs. Much of it was charmless highway, but the final stretch through the San Jacinto Mountains on Route 74 were breathtaking. Tucker agreed. I nearly fainted with excitement when we pulled down our Airbnb rental’s charming midcentury modern street. 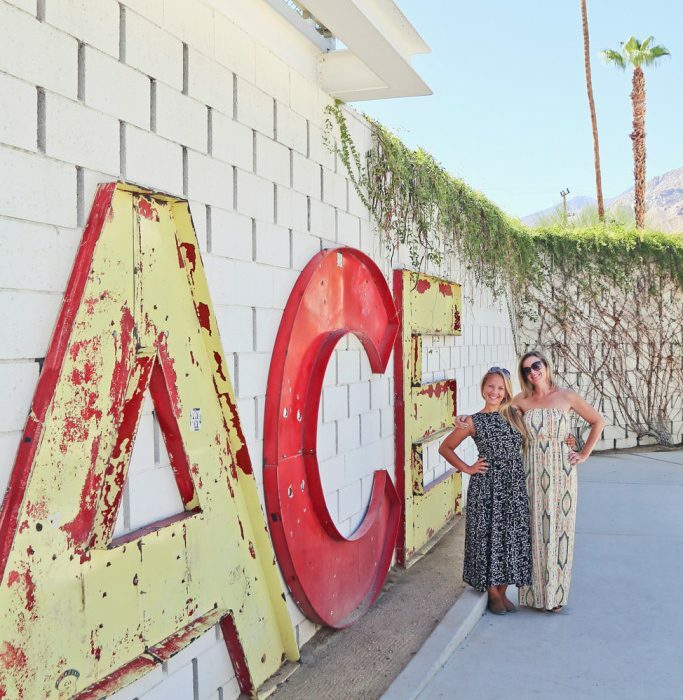 Palm Springs is lined with gorgeous hotels and restaurants, but with our pup in tow we knew we’d be best suited by a pet-friendly rental where we could make ourselves at home and cook most of our own meals. Airbnb had an impressive selection of rentals that allowed pets, and I hemmed and hawed over which of the gorgeously retro homes we should make our own for the weekend. We settled on the The Sycamore House. The property manager gave us a tour as we swooned, pointing out every detail to each other. Three cozy bedrooms each had their own character, while a chic living and dining room opened out to a spacious yard. And of course there was a pool, arguably the most important aspect of any Palm Springs pad. Palm Springs is a treasure trove of mid-century modern architecture, one of the many features that first endeared me to it. You don’t really have to do anything in particular while you’re there — just being there, soaking up the impeccable style that the residents so meticulously preserve, is ambitious enough. Later that evening, my Dad arrived after work from Los Angeles and we reveled in the luxury of preparing a home-cooked meal on the patio, snuggling on the couch for a movie, and making plans for the rest of the weekend ahead. The next morning, Tucker agreed to guard the house while we peeled off for brunch at The Ace Hotel and Swim Club, where I’d attended a gorgeous wedding the prior spring. My dad and I had taken our lazy canine companion to the Palm Springs Dog Park for a morning adventure, and he was ready for a nap. As he snoozed, we had a beautiful meal at King’s Highway, and worked it off with a walk around the grounds while I reminisced about the nuptials. But it wasn’t long before we were back at the house. Can you blame us for not wanting to stray? Kat whipped up a beautiful batch of homemade sangria, while Ian and I got down to the crucial work of exploring which pool float my dad had brought from his own backyard was our favorite. frozen grapes on a stick — my favorite summer snack! Our one goal for the day had been to ride the Palm Springs Aerial Tramway, which just so happened to be around the corner from The Sycamore House. Unfortunately, our trip overlapped with a two week period the attraction was closed for upgrades. While we were bummed at first, in the end it was a gift in two aspects — a reason to return, and a full day to do nothing but laze poolside. It was absolutely perfect and just what we needed. Words can’t explain how good this day was. That night, we enjoyed another home-cooked meal and and another early night in. We had quite an adventure planned the next day — one you’ll read all about in an upcoming post — and so we fueled up with an elaborate breakfast lovingly prepared by Ian. Am I a lucky girl or what? Later that night, after returning from our exploration, we decided to give the pet-friendly restaurant scene of Palms Springs a try. I checked my usual resource, Bring Fido, and settled on the colorful Lulu California Bistro, where Tucker was able to supervise the sidewalk throughout our entire meal. He’s pretty indifferent to strangers, which we had to apologetically explain over and over again as he turned his snout up to the adoring crowds who fawned over him as they passed by. What can I say — we’re all just guests on the Tucker Show. The trip was near flawless. The MVP of the weekend was definitely our sweet digs — we loved that house something fierce! The only bummer of the weekend was the fact that the hot tub we’d been looking forward over the evenings wasn’t working, and repairmen were poking around throughout the otherwise peaceful weekend. Other than that, we really only had nitpicks that are only even worth mentioning because it’s a high-end rental that you expect high-end service from — there was no charcoal for the grill, no wood for the stove and the shampoo and conditioner levels were super low when we arrived (to his credit the property manager ran over immediately when we called about the grill). Even with those minor annoyances, we couldn’t stop raving about The Sycamore House and I’d recommend to friends far and wide traveling with or without pets — and with Airbnb’s search filters, it was easy to find a Tucker-friendly property. Want to give Airbnb a try, anywhere in the world? Get a free credit towards your first stay by clicking the button at left! Palm Springs impressed me just as much the second time around. I had a blast spending unfettered quality time with some of my nearest and dearest humans — and my absolute favorite canine, who showed me Palm Springs is indeed a pet friendly destination. I love this quirky, trendy town in the desert, and have a feeling it will be a regular fixture in my California adventures for years to come. Have you been to Palm Springs?